The point of this post is to show you how quick and easy it is to organize your shoes and keep them in their best condition. It’s easier getting dressed if your aware of what shoes you actually own. I’ve been there, in a rush, trying to find that shoe that is at the bottom of a closet, under the family’s footwear pile, after I’ve searched the entire house. Not fun. Plastic Shoe boxes – You can buy these individually or in pkgs of 10. I purchase mine at Canadian Tire here in Canada, when they go on sale. Look your shoes over and see if anything needs mending or cleaning. Upload to a photo developing company. I order mine from Costco, with a Matte background and white border. 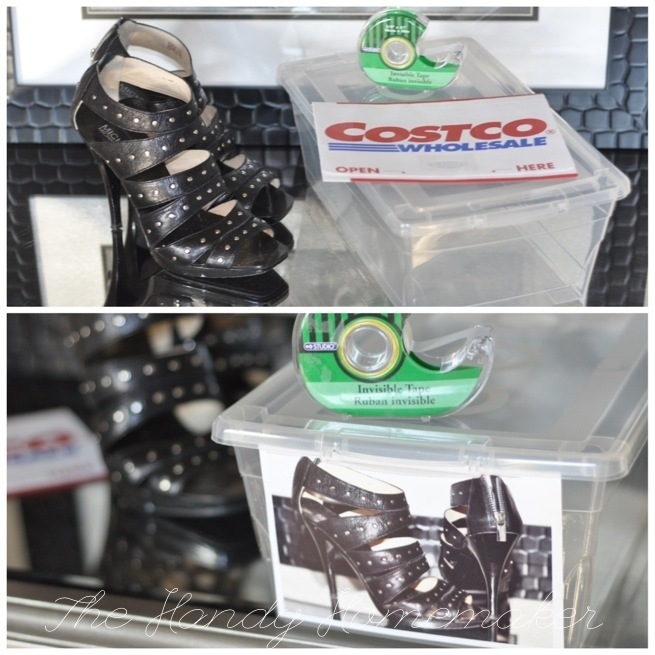 Tape the matching shoe picture to the end of the shoe box and place the shoe inside. Some of my shoes I have kept and placed the original shoe box in the box if it fits. Make sure to keep the moisture packet (silica pkg) that came with your shoes, if possible. Place on your shelf, or designated shoe storage area. I like to color co-ordinate my shoes and my clothes. That way if I am looking for a certain shoe or shirt I can go to the color section instead of searching my entire closet. I place the original shoe box into the container until I get a chance to take a picture of any new purchases. That way I can still see what shoe is in the container by the illustration on the box. This is a GREAT idea. I am having a closet expansion done next week and may just do something very similar. You are right, it is very easy to accumulate many nearly identical shoes and boots. Speaking of boots… how do you store them? Thanks SKH! For boots, I don’t place in boxes and I don’t like those hanging clips, plus who has the space to hang up your boots. I previously used rolled magazines as inserts to keep them upright and bend free. This year I found plastic boot inserts at the Dollarstore and replaced the magazines with those. (basically they are bendable flat hard plastic sheets shape to fit any boot) I store these boots upright at the bottom of a closet to minimize dust build up.